Ayr Coach Lines... Bus 311. I am guessing this tour bus will be heading to warmer climates. That bus looks more like it belongs down here than up there in the snow. Interesting painting on the bus. ...and the iguana hopes so too! At least it looks warm! A pesar de la luz fuerte del foco, has logrado equilibrar la luz. El reptil parece mira insistente las luces reflejadas en el cristal. Great night shot, Andy. The bus looks absolutely stunning with the mural on the side of it. It pops right out at you. That is one heck of a bus! Or is it a crazy expensive RV? Great shot. 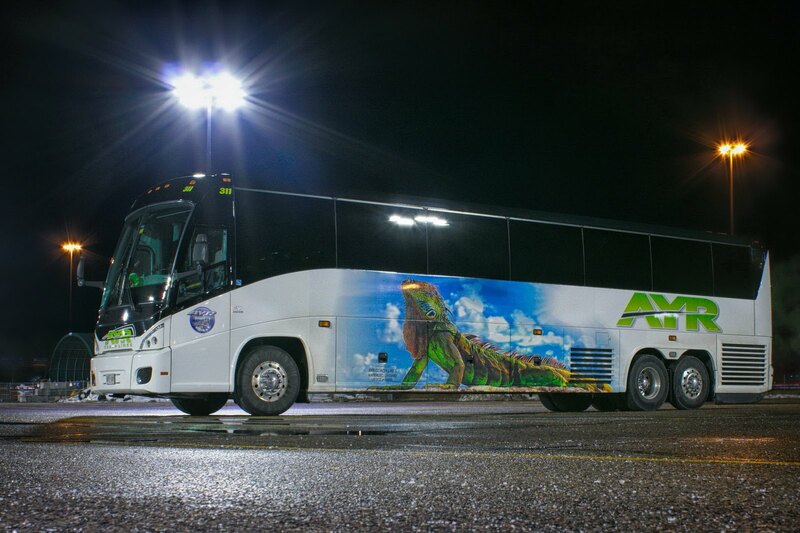 Hope this bus moves better than an iguana, but it looks great riding on the side of the bus. Wish I were going to warmer climates also. That's a good looking iguana. I'm about to go out into the road and try to flag something like this down. Warmer? I'm in! Looks rather nice - we have a place called Ayr here in Australia. Not what I'd expect in your part of the world... Great night shot, as always. Indeed a beautiful illustration on the bus. That is a nice print on the bus, how is the cold now? Snow and freezing rain forecast today. Superb capture of this beautiful bus ...this is very inviting ! I hope they are going somewhere warm!